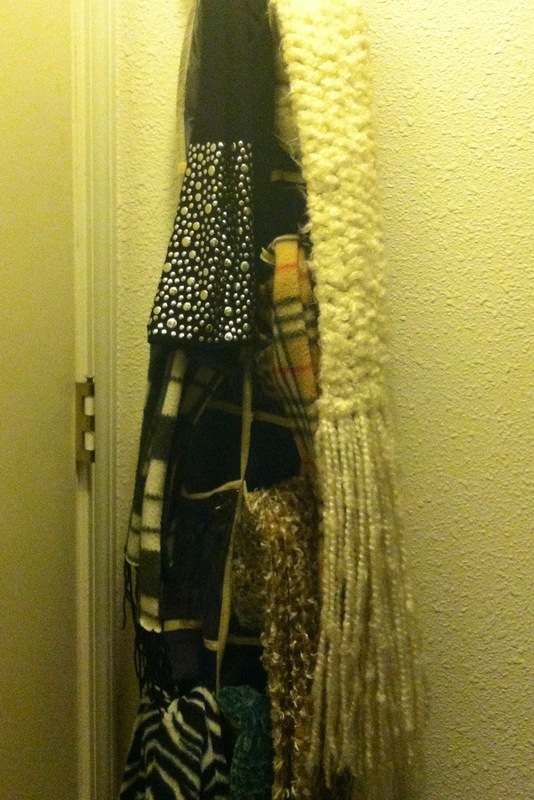 My scarf collection continues to grow and finding a place to keep all of my scarves has become a challenge. 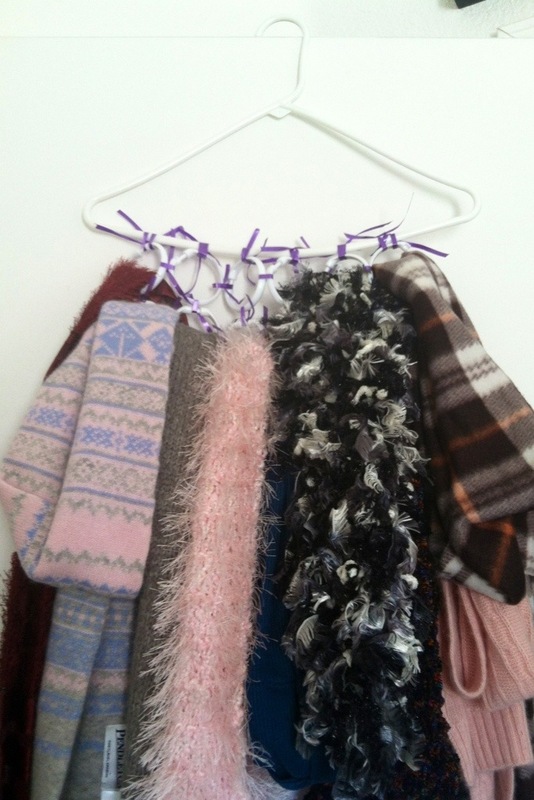 Here are three options for organizing your scarf collection. You have probably seen a version of this type of scarf organizer on Pinterest. I made this scarf organizer a couple of years ago and I don’t really like it. Heavier, winter scarves weigh the hanger down too much and they take up too much precious closet space. When the DIY hanger and shower ring organizer wasn’t cutting it for me, I went to one of my favorite places to spend 100 pennies – the dollar store! 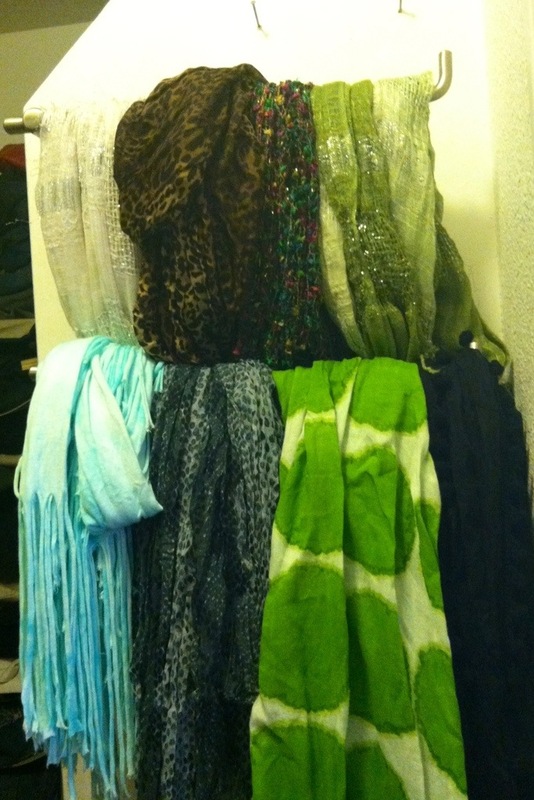 The hanging closet organizer works pretty well for scarves. The only problem with this option is you need a wall or door to hang it from and you end up stuffing your scarves into the small pouches. Extra long and thick scarves don’t fit well in the pouches. If you have delicate scarves I would not stuff them into one of these organizers. If this organizer looks familiar, that’s because I used the same organizer for my No More Junk Drawer post. I had an epiphany shopping at Marshall’s last month! Why couldn’t I hang my scarves like a store display! I started thinking of what I could use to hang the scarves on and found the solution to my problem at Ross – bathroom towel bars! For this third option for organizing my scarves, I was a big spender – buying two towel bars for $4.99 each! They work perfectly in my closet! I love that I can see the scarves hanging on the bars, they are not taking up any hanger space, and I haven’t smashed any of my scarves into tiny pouches! Since my scarf collection is so large, I have organized my scarves by material and carefully folded my “winter” scarves and put them in a storage tub in my attic. This will have to do until I get my dream home with a gigantic closet the size of a bedroom! Hope this helps with your scarf organization! How and where do you store your scarves? I also have a large scarf collection. I keep mine in what I think was meant to be a magazine/mail organizer. It hangs on the wall and has three sort of wedge shaped pockets. I roll each scarf up and stick them in there on their ends, so that one end sticks out and can be seen. Holds 20-30 scarves, looks kind of fun on the wall, and makes it easy to see what you’re grabbing for. Not as frugal as your solutions, though. I love the towel bar idea! Ooohhh! I love your idea! I know exactly what type of organizer you are referring to, I saw one at Homegoods recently. Thank you for the great idea!